Helping a local clinic expand into a national institute able to support advancements in health care research and individual patient well-being. Led by the founding psychiatrist Dr. Lane Peyton, the Rivus Wellness & Research Institute’s team saw an opportunity to broaden their services to patients seeking health and wellness care. At the same time, the clinic could no longer support the scale necessary to offer new research trials in support of advancements in medicine for patient well-being. Rivus sought our help to position the founder as a leading health advocate in support of advancement in health while still maintaining local patients and family needs. While internal morale and culture were strong during our early research and immersion process, a pattern emerged suggesting the team needed more clarity on where the founder’s new vision would take the company. Eventually, our team learned that the clinic carried a series of common operational inconsistencies and habits that would require updated internal communication strategies moving forward. A new communications strategy and brand structure helped the growing Institute better prepare the founder and employees for exciting growth ahead. The brand’s new direction provided both the founder and the expanding team with clarity surrounding their roles, and the overall vision for the newly named Institute. The Institute can now more easily describe its offer and benefits to ongoing efforts for public attraction (locally) and clinical trials (nationally). 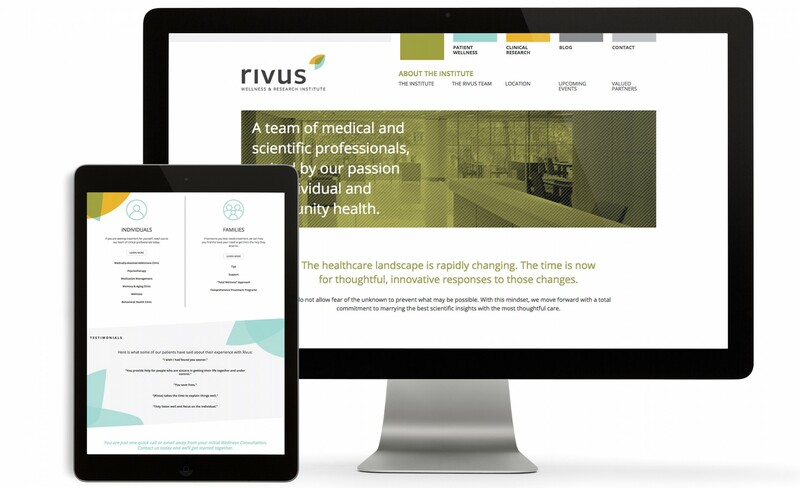 The new site embodies what The Rivus Wellness & Research Institute’s brand and team wanted to share with their patients, colleagues and community. The new name, identity, and website are receiving national attention and the Institute’s positive reputation continues to spread. We’re also seeing increased site traffic, along with an improved ranking in search results. The Institute now has a better foundation for leveraging social media, a marketing strategy, and patron support, ultimately allowing for better positioning for national brand presence.